Attending a major conference as a business owner feels completely different than attending when you work for a company. It’s not just the fact that you’re paying your way…well, that is certainly a big one! As a newbie entrepreneur you know that conferences are a great way to network but might feel a little hesitant about how to prepare for your first big conference as a business owner. 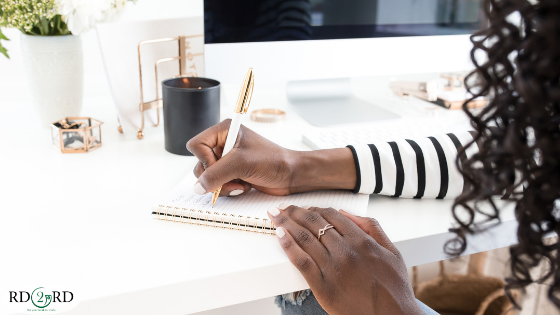 After more than 15 years in the corporate world and many conferences under my belt, I found myself feeling unsure of how to approach my first FNCE® as an entrepreneur. I knew that I needed to make connections with potential collaborators, market my business and interact with brands and influencers. It was an incredible experience and most of my most important business milestones this past year have been the result of networking at FNCE®! These are my top 5 tips for networking at FNCE® as a newbie business owner. 1. Meet new people – While this probably sounds obvious, I can’t tell you how many attendees spend the majority of their time in a bubble talking only to colleagues they already know or staring at their smartphone. FNCE® is the largest gathering of Food and Nutrition Professionals in the world! It is a time to connect with others in the field that you wouldn’t otherwise be able to cross paths with. You might be thinking, but I’m an introvert or that talking to strangers is awkward. It can feel a bit intimidating, but conference attendees aren’t strangers! Break the ice and ask which session has been their favorite, or what type of work they do. Between each session, make it a point to introduce yourself to at least 1 new person. This could be while waiting to enter the conference room or standing in line for coffee. You might be surprised how many other people are just as hesitant as you to strike up a conversation but jump in when you break the ice. Introduce yourself to people around you after you sit down at a session. Instead of scrolling social media, browsing some flyers or a new resource from the EatRight Store, use the pre-session time to share business cards and expand your network. Since FNCE last year, many people have contacted me because they saved my card or remembered meeting me at a session. It may not seem like these quick conversations have a huge impact, but you might be surprised. 2. Ask questions and listen – It’s easy to be eager to share our own thoughts or talk about our interests. Avoid making networking opportunities about you. Use the power of psychology and our desire to talk about our own interests to your advantage when networking. Instead of thinking about what you are going to talk about with people you meet, focus on planning the questions you will ask new acquaintances and how you can better listen, record your notes and create opportunities for your business. Be sure to be specific when writing out questions and have a plan for when you meet someone that has expertise in practice area or business aspect that you are interested in learning more about. For example, if you want to publish a book and meet someone with experience, you should know exactly the questions you want to ask. While there is nothing wrong with a fun conversation, try to be strategic in your networking. Ask questions that serve to create a return on investment for your business. Be confident and speak about your business in a way that clearly shows that you have charted a course for success. Every successful business has a beginning. This is yours and there is no need to by shy about it. To cultivate the most beneficial relationships and build you network, you need to send signals that you are on a path to success. Take time before the conference and plan your “elevator pitch.” This is quick description of your business. It should be short and clear, a statement that could be easily shared on an elevator ride. You must practice this pitch until you are confident and comfortable sharing it with a stranger. It will feel awkward, but having a strong pitch is essential. If you are striking up a conversation with a brand or potential collaborator, your ability to clearly and confidently share details about your business puts you out in front. For example, my 2 sentence pitch for RD2RD is below. RD2RD is a marketplace for RDs a to buy, sell and share digital downloads. From handouts to presentations and business tools all available for immediate download, it is a destination for quality nutrition resources and a way for RDs to share their wisdom and earn extra income. 4. Have a gameplan – You decided to make a major business investment by attending FNCE® and need a plan to get the most out of it. This means more than just looking through the sessions and planning which you will attend. Be sure to download the FNCE® app and get familiar with all the functionality/information available at your fingertips. This includes researching special events you can register for and scoping out planned networking opportunities offered by practice groups or brands. It means looking at the exhibitors and identifying specific brands/companies you want to connect with. Look at the conference schedule and identify opportunities to grab coffee, lunch or even a morning walk with people you meet. If you have identified these times already, you can easily suggest one and capitalize on a business-building opportunity. 5. Follow-up! – It may sound basic, but post-conference follow-up is easy to let slip. You will be tired and catching up on the work you set aside to attend FNCE®. Don’t let that stack of business cards and “let’s talk more about this” statements get dusty. Make it a point to add notes to business cards or other collateral you pick up at the conference and jot down notes. It will not be as easy as you think to remember people you meet or that great idea that came to mind while you were talking. Jot down a few notes and any specific follow-up items. Then, follow-up. Send an email. Schedule a Skype. Follow new contacts on LinkedIN or social media. Make effort to cultivate the fruits of your networking labor! Networking at FNCE® is an incredibly opportunity for your business but requires that you plan and execute. You might think that as a newbie entrepreneur, you should use this first big conference as a chance to watch and learn. Consider the return on investment if you crafted a networking plan and nailed your elevator pitch. Have fun and I hope to see you at FNCE®! RD2RD Marketplace will be at the Member Marketplace on Monday, October 22nd at booth 3007. Stop by and say “Hi.” I’d love to hear your pitch. Megan Boitano, MS, RDN, LDN, CNSC, is a nutritionist in private practice, specializing in helping families create a healthy relationship with food. She has experience with both pediatric and adult nutrition. Megan lives in Newton, MA with her husband and two sons.